Hurricane Matthew ravaged Haiti on Tuesday, completely decimating the southeastern region of the country and killing 842 people, according to local authorities. Information has been slow to make its way to the rest of the world, because areas hit hardest by the hurricane were remote coastal villages, completely disconnected from the rest of the country when the hurricane hit landfall. Haiti has been hit hardest by Hurricane Matthew of any of the Caribbean islands affected by the storm. 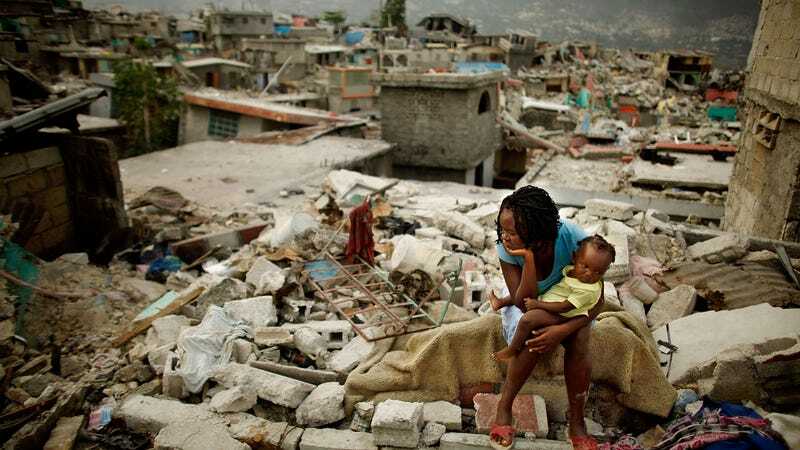 The United Nations estimates that 350,000 Haitians need immediate assistance, and UN special representative for Haiti Mourad Wahba says more than 10,000 Haitians are in shelters and hospitals that are overflowing. In the wake of Hurricane Matthew’s destruction, ABC News published aerial footage showing how extensive the damage is. The video appears to show thousands of homes destroyed across the southeast tip of Haiti, the area that suffered the brunt of Hurricane Matthew’s blows. Health officials are preparing for a surge in cholera cases in the wake of Hurricane Matthew. “Due to massive flooding and its impact on water and sanitation infrastructure, cholera cases are expected to surge after Hurricane Matthew and through the normal rainy season until the start of 2017,” the Pan American Health Organization (PAHO) said in a statement. In August, the UN admitted its role in creating a cholera epidemic in Haiti five years after it started. Since October 2010, Haiti has reported more than 790,000 cases of cholera and more than 9,300 deaths. When UN Secretary General Ban Ki-moon finally admitted the organization’s role in the epidemic, he also promised a “significant new set of UN actions” to fix the problem. Now, in the wake of this most recent tragedy, the UN’s promise to fix the cholera epidemic will be put under a major stress test. There have already been 28,500 cases of cholera reported in 2016, and that number is expected to increase dramatically, especially in areas of the country with limited access to clean water. The cholera situation could get worse really fast, given the state of affairs on the ground in Haiti. According to PAHO, only nine of Haiti’s 15 main hospitals are currently operating. One of the hospitals has been evacuated and only five of them are reachable by phone. PAHO also says that bridge collapses have made access to three hospitals difficult.